“When my contractions grew intense, my husband and I just threw the hospital bag in the car and left for the hospital!” recalls Garima Shinde Neog. Like Garima, its always better to be prepared in advance, so you’re not running around for things at the last minute. 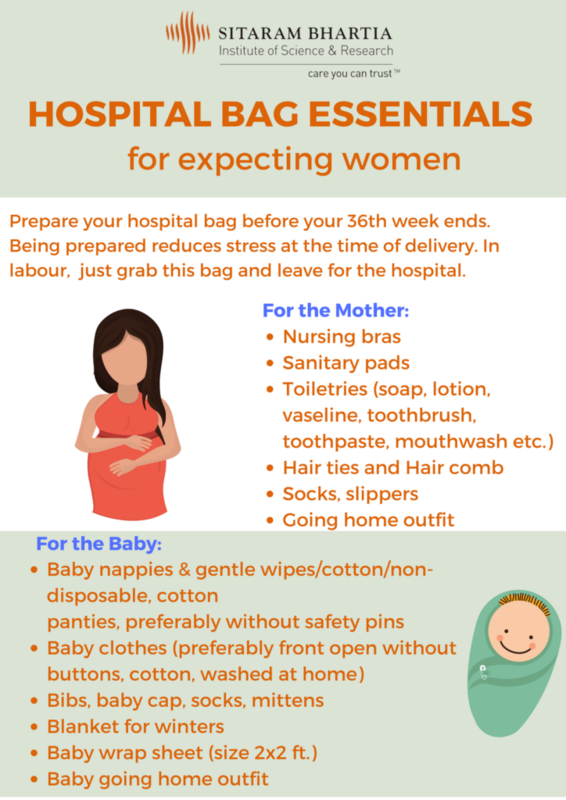 Ideally, your hospital bag for delivery should be packed before your 36th week ends because once you’re at full-term (37 weeks), labour could begin at any time. You’ll need to pack enough supplies for yourself, your birth partner and of course your baby. Hospitals can vary widely in what they allow you to bring when you come to deliver at the hospital.Remember to check with your hospital if you have any specific concerns. Our checklist (infographic) below should prepare you regardless of where you deliver. A copy of all your medical records. Consultation papers or your OPD booklet. A fresh outfit for going home. Bring loose and comfortable clothes that you can slip into easily. Stepping outside the womb is a huge change for new babies so it’s important to keep them as snug and warm as possible.You’ll need enough clothes to keep your baby comfortable and tightly wrapped. At least three-dozen cotton diapers preferably without safety pins. New babies need to be changed very frequently! Two to three sets of baby clothes. Bring extra layers for your baby if you’re delivering during winter. The pharmacy at Sitaram Bhartia also stocks baby clothes for parents who haven’t been able to go shopping before the due date. Your birthing partner will be amongst the most important members of your care team and will spend a lot of time on their feet. Here’s what they’ll need to bring.